poplovedance: The Big Interview: Jimmy from 911! The Big Interview: Jimmy from 911! Hi Jimmy, I was in the audience for the first Big Reunion show at Hammersmith Apollo in February and was really wowed by your performances. It was the first time I'd seen you live in 15 years, as you performed at my primary school near Brighton way back in 1998! Your vocals are as strong as ever and all three of you still have the moves. How did you feel coming out for the first time in years in front of an excited packed crowd at Hammersmith, singing the words back at you? Hammersmith was a very exciting but nervous time. We love being on stage but seeing the great reaction was amazing. We still have a lot of loyal fans and hopefully new ones too. 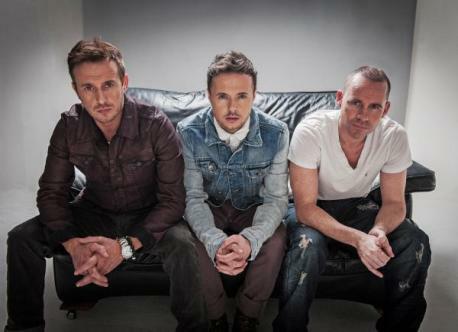 What are your favourite memories/stories of the Big Reunion tour? If there was to be a second series, which other 90s/00s bands would you like to see taking part? Top of my wishlist would be A1, S Club 7, Eternal and The Corrs! My memories from the tour were great ones. Mixing with all the bands and talking about the old days was very interesting. Playing at arenas again was the highlight for me and obviously the o2 being the biggest. I would like to see Eternal, S Club and East 17 back for next year. So the new album is called 'Illuminate: The Hits and More'. How have the old hits been updated? 'Illuminate' has 7 old songs that have ben updated on the production side of things. We thought it would be good to give them a little polish after so many years. Can you tell us some more about the new songs from 'Illuminate: The Hits and More'? 'Two Hearts, One Love' is a very anthemic rousing pop song, it's mature but retains the old 911 spark and is a great comeback single. Are the other new tracks similar or are there some more uptempo songs along the lines of 'Bodyshakin' and 'More Than A Woman' too? 'Two Hearts One Love' is a great anthemic song, the rest of the album has some good uptempo stuff on it as well as big ballads. Bit of everything for the pop people out there, just a little maturity in the writing. You were very honest on the Big Reunion TV show about your past and present lives and working relationships. How have you got on with the writing process of 'Illuminate: The Hits and More'? Have you found it easy to get back together and write with one another? We always said we would be honest with the TV show and i think we have done it well. Getting back together has been like therapy really, we have aired all of our problems and now we can get on with writing great music. It's been very easy getting together to write in the studio again. How did you feel back in 1999 when you topped the UK charts for the first time with 'A Little Bit More'? 'More Than A Woman' was narrowly beaten to the top by Spacedust's 'Gym and Tonic'. It's fair to say that 'More Than A Woman' is the far more remembered single now, and in fact I haven't heard 'Gym and Tonic' since 1998! Did it make the chart victory a few months later with 'A Little Bit More' that much sweeter? The story with 'More Than A Woman' was interesting. Spacedust was found to be illegally bought in and was stripped of the number one slot. So officially we got a number 1 there too. But getting it with 'A Little Bit More' was even better, we were in Ireland doing a TV show when we heard. You were incredibly popular across Asia at your peak, as well as in the UK, what was it like being adored by millions and causing hysteria wherever you went? Do you still experience that now, and how do you cope with it? Asia was insane for us, whole of the top floor of hotels, army escorts everywhere etc... We were amazed by the reaction and are hoping to get back over there soon. We don't experience that now as we are only just making a comeback but fingers crossed! In the years that passed since your split and reunion, boybands very much fell out of vogue in the UK, and were seen as very uncool in the noughties. Are you pleased that the likes of JLS, Lawson, The Wanted and One Direction and the returns of Take That, Boyzone, Blue, 5ive and yourselves have brought boybands back? And why do you think that the boyband concept has suddenly become so popular once again? Boybands will always be around as they are part of a teenage girl/boy growing up process. The latest bands are doing really well and we wish all the luck to them all. What is your absolute favourite single from your back catalogue and why? For me, my single would be 'The Day We Find Love'. Just a great song with lots of memories while writing it. 'More Than A Woman', 'Bodyshakin' and 'A Little Bit More' are undeniable pop classics but my personal favourite 911 single was the 1999 top three hit 'Private Number'. Do you have any idea what happened to the brilliant female singer on it, Natalie Jordan? 'Private Number' was also a great song. We still meet up with Natalie for coffee. She is doing well, still singing and screenplay writing. Fellow Big Reunion-ers Blue did well representing the UK at Eurovision 2011, finishing the night with 100 points which is almost 100 more than we usually get! Would you be open to doing Eurovision if you were asked? I dont think Eurovision is good for anyone, but you never know. Thank you Jimmy, I wish you all luck with your new album and can't wait to hear the new tracks! Five b-sides that are better than their a-sides! Three rising male stars to watch out for! A trio of recent gems from South Africa!